Finding the right motivator is key in working with early childhood. Bubbles may be just the trick! I’ve recently fallen in love with bubbles. 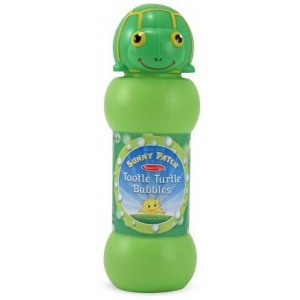 Well one particular brand of bubbles, actually: Tootle Turtle. These are seriously the most amazing bubbles I have ever used, and in the last few months I’ve gone through 3 different brands between my one year old and my music therapy clients with very little luck. Unlike most brands, these actually create a long stream of solid bubbles with almost every breath instead of having one good streak followed by 3 or 4 disappointments. Not only are the reliable, but will often create dozens of bubbles in one blow. Amazing! And they don’t stop there–the bubbles themselves are somehow more “durable” than others too. It seems weird to label a bubble as “durable” but it’s just true. They last longer and seem to look more solid than other flimsy bubbles that I’ve played around with. Not only is all of this super fun and satisfying for me (I admit I really enjoy bubbles too!) but it is so beneficial in a therapeutic context, especially with early childhood. If I’m working with a child on vocalizing words like “more” or “bubbles” or some other verbal or sign language communication, I am able to deliver what they ask for right off the bat. Compare this to the disappointment or confusion that may come when they ask for more and you struggle 2-3 times to get one little flimsy bubble…kind of loses the moment right? It also literally surrounds the child with bubbles, which contributes substantially to the natural delight that comes with bubble play and children. Since I’ve been using bubbles more often in the past few weeks we’ve naturally developed a few fun ways to use them to address early childhood client goals. Thought I’d share a few ideas here. Several of my clients are working on verbal or signed communication, and requests are a solid place to start. Requesting “bubbles” or “more” bubbles, (or even putting the two words together) has been a reliable motivator. I like to structure the intervention by singing a little song with my guitar while the bubbles float around then “pop”, then give a sung verbal prompt for the child to make his or her request (I can only do this if it’s a group setting or the parent is there blowing the bubbles, of course. Otherwise I don’t use the guitar and use my voice as a cue). One of the speech therapists with whom I co-lead gave me the idea of having clients request if they want the bubbles to go “up” or “down”. This introduces directional concepts as well as verbal communication. It’s been a fun way to add variety and functionality to our bubble play. I pulled out some colored ribbons while we were doing bubbles this week and my client started waving them to pop and move the bubbles around the room. It ended up being a lot of fun and is a great way for kids to work on body awareness (being aware of where other people are and not hitting them with the ribbons while being so engaged in a process), colors (using a certain color ribbons to pop the bubbles–and of course putting that into a song :), and/or motor control and imitation (waving ribbons in certain ways to get the bubbles to move up or down, or to target certain ones to pop). I’m sure that as I keep playing that more ideas will come for therapeutic early childhood applications. But the overarching thing that comes to mind is the benefit of natural play that bubbles bring. Play is hugely important for kids and the benefit of using bubbles (and high quality ones at that!) to elicit playful behavior cannot be overestimated. So pull out those bubbles, give ’em a try and see what magic awaits you! Early Childhood Developmental Music Groups for Children!